If it seems that there is always construction happening at O’Hare or Midway airports, you are not just imagining it. Airports are continuously in need of improvements and expansions to handle the volume of travelers as well as to conform to new safety standards. Construction is so prevalent at airports that the Federal Aviation Administration’s (FAA) Air Traffic Organization in 2010 created an the Airport Construction Advisory Council just to mitigate hazards that are caused by airport construction. In addition to hazards to those using and working in the airports, this continuous construction can cause injuries, even fatalities, for those doing the construction work. All these construction projects require workers to not only face the dangers that are normally present during construction work, they are also performing this work while thousands of people come and go from the airport. This stressful and hazardous environment can lead to serious and even fatal injuries while on the job. Construction workers in airports such as O’Hare and Midway are constantly exposed to hazards on the job, facing possible injury. In November 2013, a construction worker at O’Hare fell to his death while working on an electrical project on the roof of the airport. Unfortunately, this is just one of the many injuries and fatalities that can happen while working on construction projects in airports, especially if safety precautions are not in place. Construction workers can have serious injuries from these types of accidents, leading to lost time from work, medical bills and a loss of quality of life from pain and suffering. While workers are generally covered by worker’s compensation under the Illinois Workers Compensation Act, which can cover many expenses from construction injuries, there may be other avenues to receive compensation for injuries during an airport construction accident. 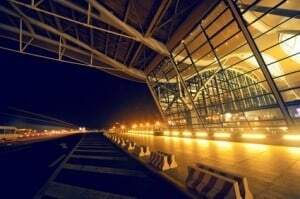 In some cases there may be instances of negligence, from the construction company or even the airport, that may have contributed to the injury and may be legally relevant in obtaining additional compensation for injuries or wrongful death. A construction accident at an airport entails different areas of the law and different entities than your average work injury lawsuit. Rosenfeld Injury Lawyer is proud to have represented skilled trades people injured while working at airports such as Chicago’s O’Hare or Midway. As a law firm committed to your success, we only charge a legal fee when there is a recovery for you. Call us anytime to discuss your airport construction accident case.